The unique characteristics of oak make for a strong, reliable walking companion that is just as dependable on the hiking trail as it is on the paved, urban street. To make the 48-inch Brazos Twisted Oak Backpacker Walking Stick, we carefully choose a solid piece of oak, cut it to size on a table saw, router the edges, and then sand the stick down, giving it our distinctive twist. 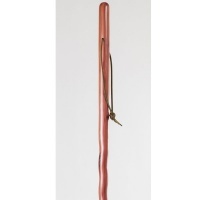 This staff is then beautifully stained in a gorgeous red color. Finally, each stick is sprayed with a clear coat lacquer. The result is a smooth finish that highlights the wood's intrinsic beauty. 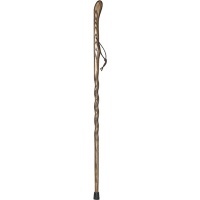 The finished staff is a one-of-a-kind, handcrafted walking stick that is both sturdy and attractive. This staff comes in a 48-inch size. 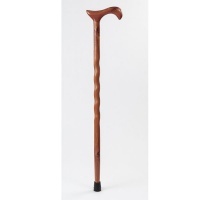 The Twisted Oak Backpacker Walking Stick comes with a standard rubber ferrule for a firm, secure grip on virtually any surface. 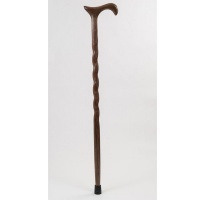 Like all Brazos finely crafted walking sticks and canes, the Twisted Oak Backpacker Walking Stick is made in the USA by our skilled craftsmen using the highest quality wood and time-tested methods. 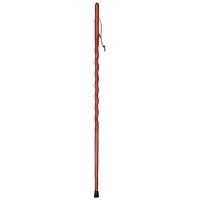 The 55-inch Brazos Twisted Oak Hitchhiker Walking Stick is handcrafted from a solid piece of oak, making it a strong and relatively lightweight walking stick that is ideal for any hiking endeavor. Incidentally, ash is the wood-of-choice for making baseball bats, thanks to its renowned strength-to-weight ratio. Each piece of oak is meticulously chosen, prepared, cut, and sanded, giving it our distinctive twist. Each staff is then beautifully stained in a gorgeous brown color, magnifying the wood's beautiful grain patterns. Finally, every stick is sprayed with a protective clear coat lacquer. The result is a smooth finish that highlights the wood's intrinsic beauty. 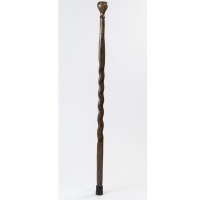 The finished staff is a one-of-a-kind, handcrafted walking stick that is both sturdy and attractive. This staff comes in 55-inch size. 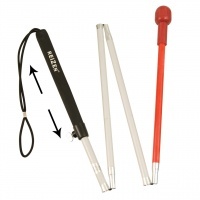 The Hitchhiker Walking Stick comes with a standard rubber ferrule for a firm, secure grip on virtually any surface. 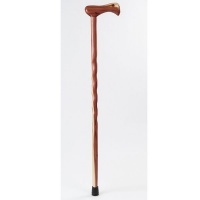 Like all Brazos finely crafted walking sticks and canes, the Hitchhiker Walking Stick is made in the USA by skilled craftsmen using the highest quality wood and time-tested methods. Helpful for those with arthritis, limited dexterity, etc. Enjoy easier food cutting and handling! 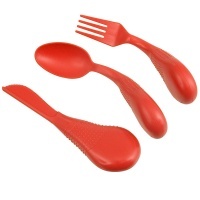 The ergonomic grip of these utensils makes eating simpler, less tiring and more pleasant. They were designed to make the best possible use of hand strength, allowing people to eat without assistance and enhance their independence. Easy to pick up, hold and control! These uniquely shaped utensils measure approximately 6 in. long and have oversized, rounded handles for easy gripping. The fork and spoon are molded in a swooped curve shape that enables the user to eat regardless of their wrist position (ex. arthritic with wrist in flexed position). The Easy to Hold Utensils are very helpful for those with limited hand strength or manual dexterity challenges. They create a unique axis for the utensil within the hand, allowing for multiple gripping positions. And the handle can be rotated within the hand to provide maximum flexibility and control. You're not likely to find any other utensil grip that feels quite as natural in your hand. If you have a limited range of motion in your wrist or fingers, you'll love the way it sits comfortably in your palm. Position it up and out, or straight down - whatever is more comfortable to you. You can even keep your index finger on top for extra control. Measurements (Set of 3 in Pouch): 8.5 in. x 5.0 in. x 1.75 in. Weight (Set of 3 in Pouch): 3.5 oz. 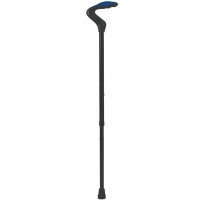 The HealthSmart Adjustable Comfort Grip Cane is a sturdy black aluminum cane with a blue comfort grip. 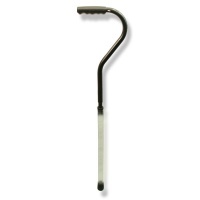 The Comfort Grip Cane features a gel-top offset handle to reduce hand stress and fatigue, and its unique design provides center of gravity support. 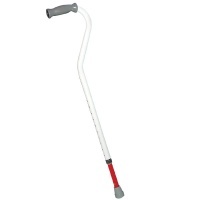 This support cane is height adjustable from 33" to 37" for a proper fit. Weight Capacity is 250 lbs.